Yup, you're right @CrashHelmut, I can't get an ADSL line and there's an exchange 70m from my front door. Once your ADSL is up and running it's usually pretty consistent, but people who've had ADSL for a while forget what a mission it is to get anything resembling decent service out of Telkom. I've had to go with a 3G connection now from 8ta, which is pretty consistent but isn't close to being affordable at the type of bandwidth usage figures the Xbox One would require. With houses being as expensive as they are there are a bunch of people I know that are buying in apartment or cluster complexes, which usually don't cater for Telkom lines at all, so they're forced to have wireless internet which is infinitely more expensive per MB than an uncapped ADSL connection. Don't forget that many areas don't even support 4mb ADSL access yet, nevermind 10mb. Just because you can get 10mb doesn't mean the rest of the country can. Not to even mention the fact that Telkom's network is ****ed after their upgrades last October. There are so many areas with exchange congestion where people struggle to just stay connected to the internet. We're currently experiencing heavy exchange congestion in Stellenbosch and have been since January. Most days I'm lucky if I can get playable pings on international servers for MMOs and the like and it's not uncommon for me to play with pings over 100, sometimes approaching 200, on local game servers. At friends we got 4kb/s download rate on a 4mb line. After about 3 months of compaining to afrihost and telkom afrihost came and did something to the box on the poll and after 6 hours of down time we were getting 400kb/s telkom must go die. Telkom still hasn't responed to the call but luckily afrihost decided to instead. Last edited by Sylar_dl; 13-06-2013 at 12:17 PM. Cole's train was right on time. Yup, you're right @CrashHelmut, I can't get an ADSL line and there's an exchange 70m from my front door. Once your ADSL is up and running it's usually pretty consistent, but people who've had ADSL for a while forget what a mission it is to get anything resembling decent service out of Telkom. I think this perception is very much a case of complaints being hugely over-represented in comparison with positive comments (as it always is, really). I've had nothing but excellent service from Telkom - after applying for an ADSL line, I was set up within a week, and any subsequent problems I've experienced have been resolved in one or two days. You've obviously never tried to get Telkom to troubleshoot a congested exchange then. Me and several guys on MyBB have been trying for 6 months now to get Telkom to simply fix our exchange in Stellenbosch, but not only do they refuse to fix it, they deny that there is anything wrong in the first place. This despite the fact that we had none of the issues we're experiencing now last year, that it shows all the signs typical of a congested exchange and that my ISP actually explicitly told me that my internet problems are due to exchange congestion. This isn't an isolated incident either. The people from La Lucia are experiencing the same thing, and have been for the past year and a half. Telkom still hasn't done anything about theirs. When Telkom's products work, they work well, but if they're broken then good luck trying to get them to do anything about it. Then Telkom in the Cape is far more accommodating than Telkom in Jozi. I haven't heard of a single person, be it relative, friend or acquaintance that has received decent service from them. Everyone I know that has tried to set up an ADSL connection, whether they've had a fixed line prior to their application or not, has waited 3 weeks MINIMUM to have everything sorted out. I'm not badmouthing Telkom because it's the norm, I'm badmouthing them out of personal experience. Fine, then I'll put my hand up for Telkom JHB. I used Mweb to order my line for me when I bought a house. It was installed within a week, and active a few days later. I was having speed issues sometime last year, called, Mweb did their usual fixes which didn't work, so Telkom sent someone out the next week, and he sorted the issue out quickly. Don't take the bunch of whiners over at myBB as in any way "representative" of the majority. I will say telkom gets you set up generally fast but have a problem and it will be 5 hours before you get through to someone at there call center. If you choose the option to be a new client instead at the begining of the call you are instantly talking to someone. A couple of months back, our exchange got hit by lightning, and our line didn't work. Telkom kept changing the estimated repair date and when we called them, they gave no explanation other than it being an "area fault". We didn't have ADSL for about three weeks. Only after I made a complaint on hello peter did they call us and tell us what the actual problem was(some municipality beurocracy supposedly) and then magically, a few days later, it was fixed. If there was another viable option, we would have dropped Telkom then and there. For me, internet (read: Telkom) in SA isn't reliable/trustworthy enough to give me confidence in an always online system. If I played SimCity for example, I wouldn't have been able to play it for reasons that are not my fault/beyond my control. Right now I'm on an Afrihost 2 meg line that runs perfectly about 90% of the time, but even Gaikai has a recommended speed of 3 meg I think. So even then I might not get 100% of the PS4 experience, but at least I know I won't be disallowed access to games and a console I paid vast amounts of my money for because of something that I can't control. @Cleric maybe I'm having problems because Telkom just doesn't like The South. Last edited by NecroWolf; 13-06-2013 at 02:51 PM. But why are you people dealing directly with Telkom? I pay Mweb for my line, so it's up to them to go directly to Telkom, saving me the hassel of ever having to hang on the phone. And they're incentivised to do it quickly because if they don't fix it, I don't pay them. Don't take the bunch of whiners over at myBB as in any way "representative" of the majority. It's always so curious. People who haven't seen the dark side of a company will always call those who have, whiners. I've also had instances where Telkom helped me resolve my issues within minutes, but I'm not dumb enough to think that's the case for everyone or that my positive experience means other people are exaggerating their issues or are 'whiners,' as you put it. Because my line is with Telkom? Regardless, if there is a Telkom fault on your line, Mweb isn't going to be able to do **** unless Telkom fixes that fault. If you start experiencing exchange congestion let me know whether Mweb will be able to get Telkom to fix that for you. As I said, when Telkom's products work, Telkom is a joy. Start to encounter serious issues, however, then you might as well try and squeeze water from a rock because it will be easier to do than trying to get anything out of Telkom. Last edited by Zoop; 13-06-2013 at 03:19 PM. 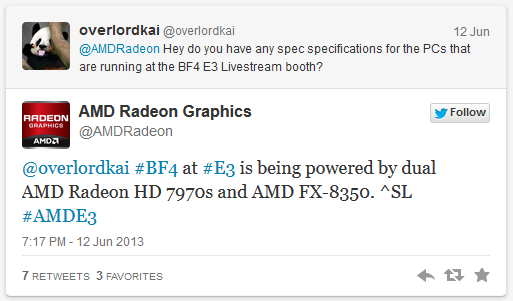 Man, E3 2013 is shaping up to be one of the most awesome and unforgettable trade shows I've ever seen. Not only do we have the beginnings of the next console war, we also have some amazing games coming our way, including Ubisoft's The Crew, DICE's Battlefield 4 and Mirror's Edge 2, Metal Gear Solid 5 and more, but there was also lots of support from Sony and its fans for the removal of DRM restrictions for second-hand games. Speaking of Battlefield 4, did anyone see the epic 64-man multiplayer demo they had going? Check it out, because what was happening there made things very, very interesting for PC gamers - the whole thing was powered by AMD. Hit the jump for more info. We had a similar issue before, and they sorted it out in a timely manner. Telkom can be decent sometimes, maybe even most of the time. When that's not the case, however, it becomes really frustrating because their support stucture can be rather unhelepful and is also hugely uninformative. Not until I complained on hello peter was I aware of the nature of the problem I had and also why there was this massive delay. That just sows seeds of doubt. This is why I'd love to see LLU implemented. Put the last mile in the hands of ISPs (unless I've horribly misunderstood what LLU actually is). Right, back to that E3 thing. The Order looks like a very interesting concept. That time period is one that's gone largely unexplored in games and it's nice to see fresh ideas. It looks like they're trying to build a very deep, rich lore much like the Resistance series. The visual style is very cool looking too. I saw some gameplay from Driveclub and The Crew. These look like very interesting additions to the racing genre because they reward for more than just crossing the line first. Driveclub throws a bunch of mini-challenges within events, so you get points for maintaing average speed in a section, getting a perfect line through a paricular corner, getting a good drift, reaching a certain speed etc in addition to traditional lap times and race posistions. I like the idea both games have of having you form teams with other real racers and collaborating and forming a group indentity. Plus Driveclub will be free on PS+ :D.
As good as Watch Dogs looks, and as much as I want it. I think (ironically enough) that Ubisoft is over-sharing on that game. I've seen enough of the game to know what it's about on gameplay level, and I'm willing to invest myself in that world. I don't want to get tired of seeing it, though. Quick list of other games I'm excited about going forward: MGS V, FF XV, Infamous:SS(looking so fun), PES 2014, GT6. Still have more games to look at. Okay so I posted earlier that DICE LA was going to develop the new Battlefront. At least a little hope is restored. So the REAL DICE is making Battlefront, and the other guys are just there to release DLC/Patches? also has his first ban bet. MS is creating a digital console. They cannot backtrack. And so it came to pass that some guy was playing on an xbox one and it crashed to a Windows 7 desktop because oops. 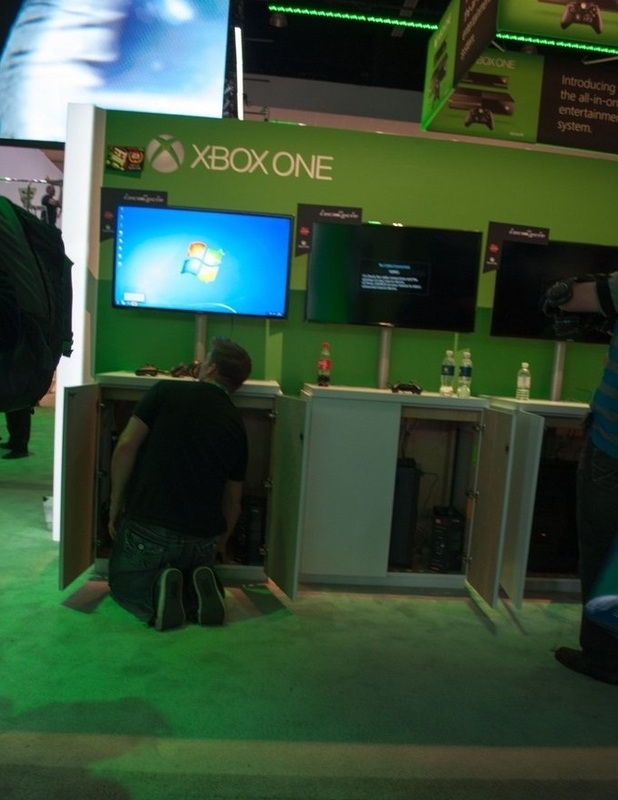 Methinks the Xbox One is like the cake, you know.